Family Volley: When our Children Lie - What Should We Do? When our Children Lie - What Should We Do? A few weeks ago I spent the morning at Studio 5. It is a local daytime television show, and it is always fun to contribute. Brooke, Darren and I spent a few minutes talking about kids and lying. Why they lie, and what to do. Do your kids ever lie? Watch the video for some great pointers on how to deal with it. 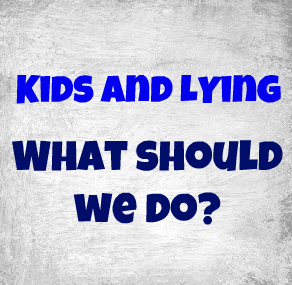 If you want more in-depth information, read this post on Kids and Lying. Do you ever fib around your kids? What's the craziest lie you have heard from your children? You give great reminders to lavish praise after telling the truth as well as thanking them for the truth. Hi Heather! I've been following you for a while but never comment. I watched the video and LOVED your tips! My oldest is only 4.5, so I'm still learning A LOT...something your blog helps me do! Thank you so much for your gentle but wise advice! Fabulous post. And I LOVE the new look of the site. Hi Meg, thank you so much for your kind comment. that was so good! I have a fibber in my house and I don't always react the correct way. This was a great reminder for me! No fibbing.Kids are smarter than you think. They will catch you. I got caught once and that was it!! No more. Telling the truth is very important in our house. It determines your character for life. You must be a trustworthy person of you will have problems with family, job, relationships, etc. It's a must. What about other children constantly lying to your children? Not sure how to handle this one.Any suggestions would be appreciated.